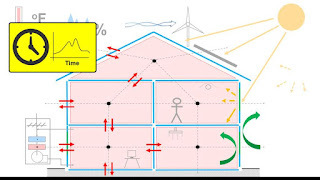 Modelling energy model of close system occurs several elements these are wall,floor,ceiling,windows and doors, mechanical ventilation system, outside temperature and humidity level, lastly, peripheric elements situated around system. Besides that, openings positions, dimensions effects illumination and heat gain of the interior system, in addition with it, natural ventilation also helps to total energy need and refresh the indoor air quality. Although, model can not be completed for some reasons which are lack of data set content or data set don't work with dynamic model. Mass and heat transfer laws helps the construct formulation between components of energy model and comfort index of interior. There are three main element to define comfort these are indoor air temperature (◦C), indoor relative humidity(%) and indoor CO2 concentration. The indoor air temperature is uniform everyplace in the modell. The heat gain comes from room surfaces by convection and from openings as radiation. Mechanical ventilation and natural ventilation both support heat gain reflex and contrary, also heat loss reflex. Human activity and electrical devices can change indoor temperature level because they are heat sources. The surface temperature of the walls, ceiling and floor. HVAC system type, capacity and position. Outdoor climate properties, the outdoor air temperature and the diffuse irradiance passes from openings. Number of people and usage density of electrical elements. The aperture of openings, the outdoor wind velocity and the wind direction directly related with natural ventilation. 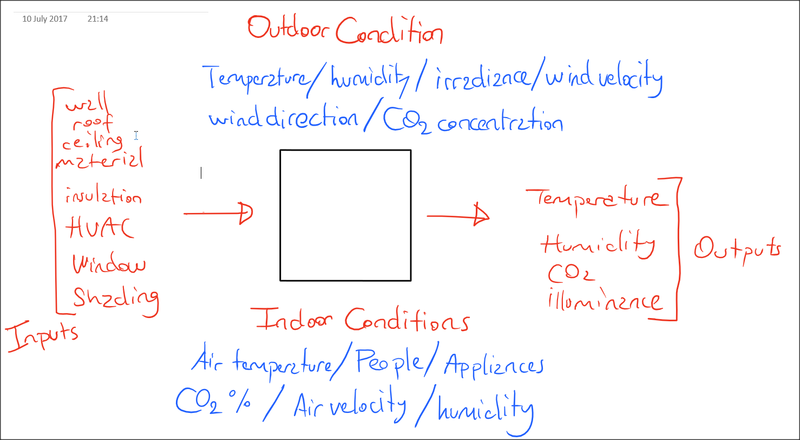 The indoor relative humidity can effect negatively of comfort level interior space unless controlled well. 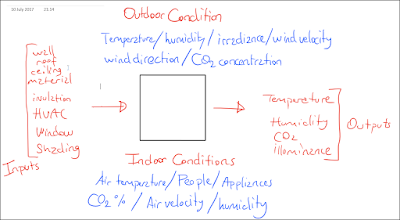 There is indoor humidity level balance which effects from building type, building usage function, occupants daily activity, infiltration, mechanical and natural ventilation (flow to interior and flow to exterior). Insulation type, building interior elements of durability level. The aperture of openings, the outdoor humidity level, the outdoor wind velocity and the wind direction directly related with natural ventilation. 'Sick Building Syndrome' induce several respiratory disease, hence, unbalanced CO2 level. 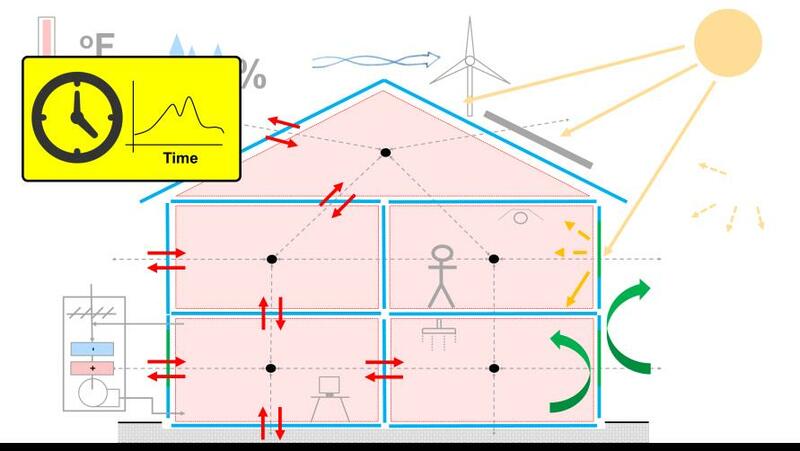 For this problem, there are several methods to consider, such as, mechanical - natural(depends on time and weather) ventilation and infiltration of poor indoor air.Function and type of building, number of people effects directly the CO2 concentraiton level(mg/m3). The calibration methodology contains steps: the first step consists in performing single experimental tests for each of the involved processes in order to obtain an approximated estimation of their associated unknown parameter values, used to calibrate the value of the unknown parameters, whereas similar tests are used to validate the chosen parameter values. Secondly, a range around the estimated value is chosen (approximately a 25% of the estimated value) and then, the model is calibrated through the use of genetic algorithms. In the following sections more information about the proposed methodology is provided. 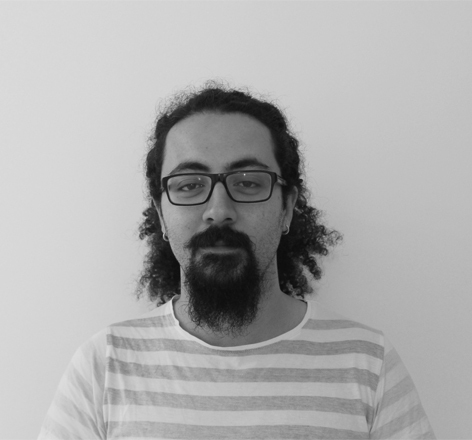 To obtain an estimation of the values associated with the unknown parameters Ψ, it is necessary to perform different experimental tests for each involved process. However, in some cases, these experiments are not easy to perform, since some of them can have a high economic cost or present a long duration. Instead of ignoring unknown parameters taking constant value will help approximation of reaslistic results of predictions model. Comfort Control in Buildings, María del Mar Castilla José Domingo Álvarez Francisco Rodríguez Manuel Berenguel, 2014, Springer.